Jaguar Land Rover (JLR) has unveiled a new ‘Pothole Alert’ research project which could see information on road conditions detected and shared with other parties via the cloud. According to the Whitley-based carmaker, the MagneRide sensing technology enables vehicles to calculate the location and severity of potholes, broken drains and manhole covers. This data could then be shared with other vehicles as a warning, or with road authorities to help prioritise repairs. “By monitoring the motion of the vehicle and changes in the height of the suspension, the car is able to continuously adjust the vehicle’s suspension characteristics, giving passengers a more comfortable ride over uneven and damaged road surfaces,” said Dr Mike Bell, global connected car director, Jaguar Land Rover. 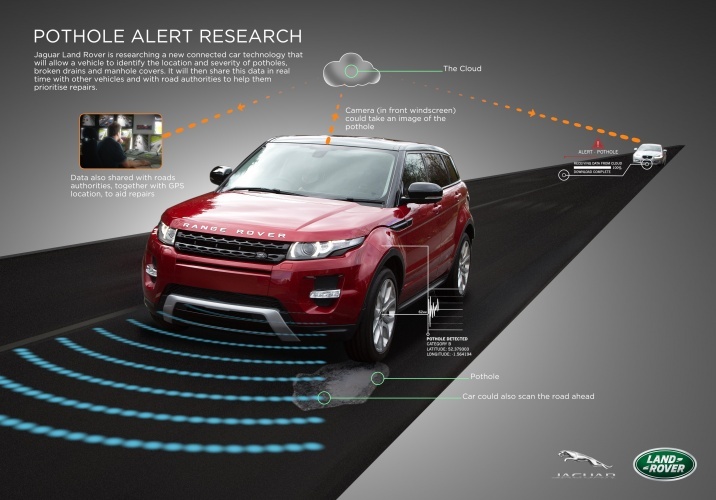 Currently all data is collected directly from the road as a vehicle passes over an anomaly, but JLR is planning tests with its Range Rover Evoque research vehicle using forward-facing stereo digital camera technology that can scan the road ahead and assess potential hazards. “Ultimately, sensing the road ahead and assessing hazards is a key building block on our journey to the autonomous car,” continued Dr Bell. JLR is also working with Coventry City Council to see how sensor data could be shared, as well as how images and GPS locations taken with JLR’s stereo camera could be used by authorities to improve maintenance and repairs. “We are just beginning to explore how we could use this technology, but data that includes the severity of the issue, its exact location and an image has huge potential,” said councillor Rachel Lancaster, cabinet member for public services at Coventry City Council. One of the reasons there has been a big shift towards 4wd is the state of the roads. Very clever but as far as I can see the pothole problem is a result of low profile tyres. Even F1 cars do not use the such daft profiles. Nice technology, but what do you mean when you say “could help prevent billions of pounds of vehicle damage”? I think if the council have been warned of a pot hole they are liable for the subsquent costs of damage to cars that it cause by it. Now why would a council sign up to a concept that informs them? I assume you have to drive into the pothole for this system to work, or is it clever enough to detect swerving around them? I think Chris (above) must live near me. This raises the issue that it beginning to agitate medics. They fear that all these smart devices will swamp them with patients “at death’s door”. Councils will have the same worries. The real benefit of pot-hole detection will come when the system has some intelligence. It needs to measure the frequency of these reports along with their proximity to one another. Then the councils would know that a particular stretch with heavy traffic could use some attention. It might even save them money against the usual firefighting “fix it when it gets bad” approach. PS JLR probably tested this on the road into their works. It was being repaired when I visited a couple of months ago. Let me get this straight; for the system to record the pot hole and send the data to whoever is going to use it, the driver has to drive over/through the pot hole. That’s a very selfless act on the part of the owner not to risk damaging their shiny new (not to say expensive) Land Rover! Unless of course L-R think their vehicles are impervious to damage from even the worst pot hole? And honour any warranty claims if an owner does incur damage through driving over a pothole in the pursuit of data collection for the greater good. Yeah, absolutely I’m sure! I’ll stick to my own pot-hole detection system, i.e. my eyes, and drive round them wherever possible.